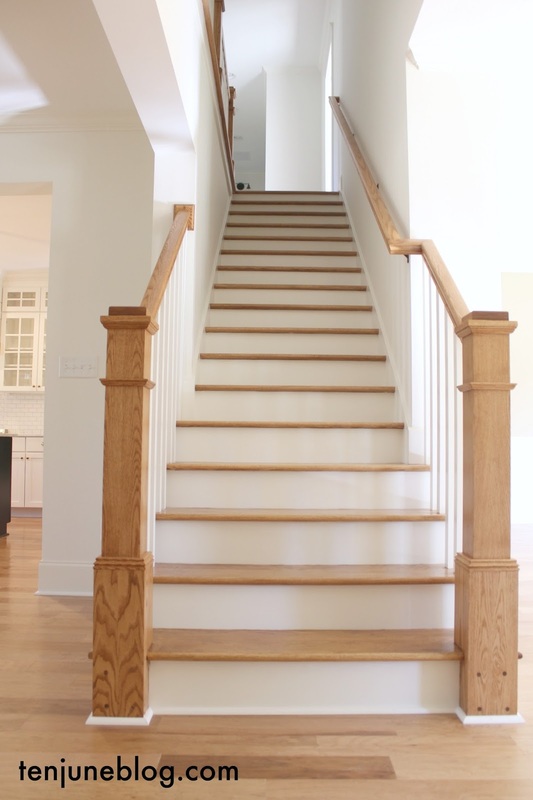 Let's move upstairs with the new house tour! I'm so glad you guys are big fans of our living room and keeping room. Upstairs in our master bedroom, we decided to start with a totally blank slate. 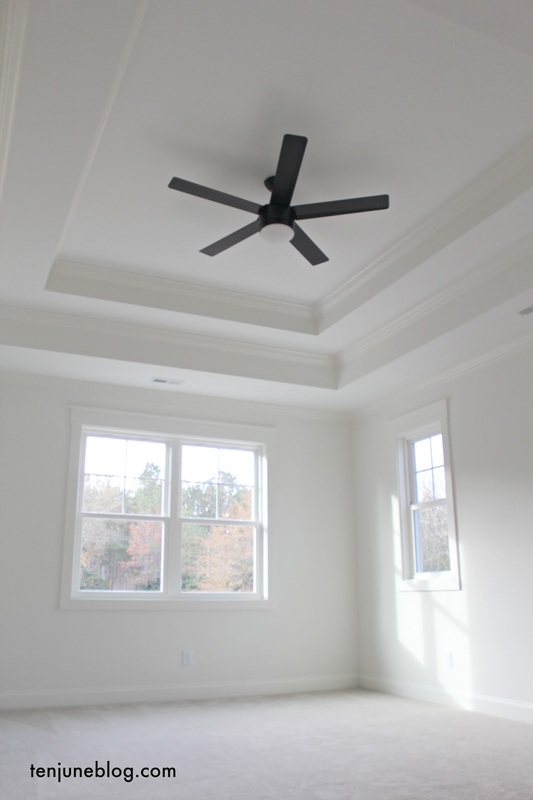 Other than the black ceiling fan and the light beige carpet, we've got white walls, white trim and a white ceiling (Sherwin Williams Alabaster on the walls and Extra White on the ceiling). My game plan for this room is to layer textures to create a calm room, instead of layering color. Bamboo blinds, a light wooden bed, vintage throws at the food of the bed, lots of greenery and some soft fluffy rugs. 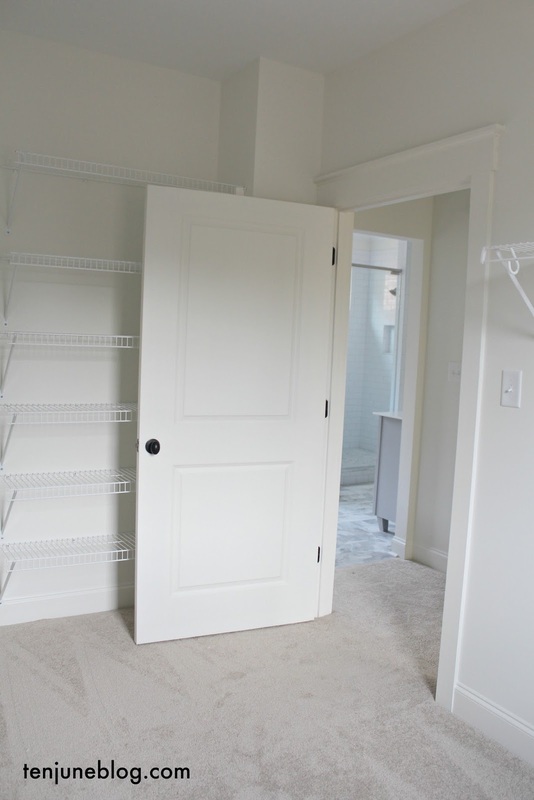 Our master bedroom closets are even more of a blank slate if that's possible! 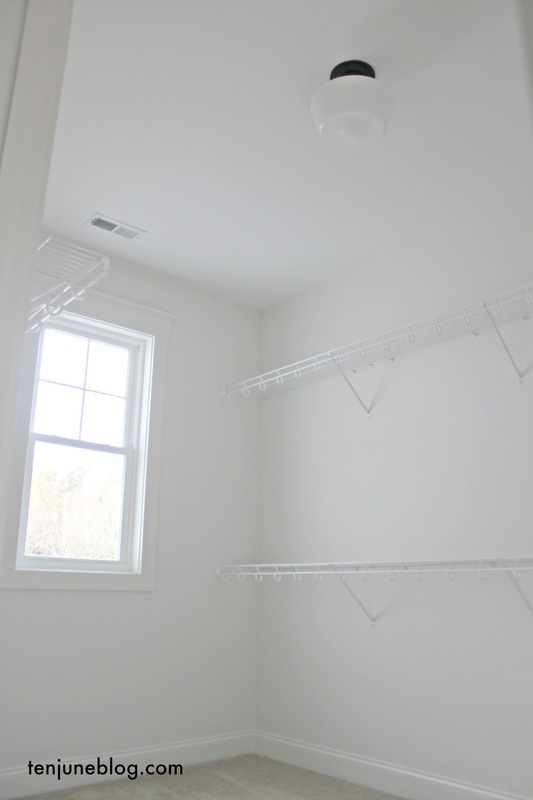 Instead of installing a custom closet plan during our build, David and I decided to install simple white wire shelves (just a few hundred dollars for two closets!) and then live with the closets for awhile. Honestly, I'm not much of a clothes or shoe person, so I have no clue how to approach this big closet! So I thought I'd give myself some time to live with it and figure it out before we spend the big bucks for a nice closet system. 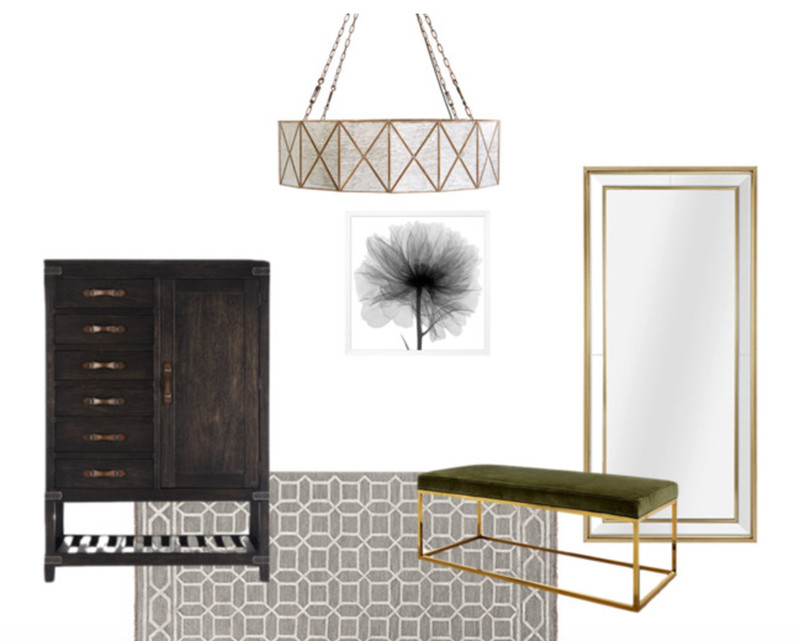 All of these beautiful items are found over on the Arhaus website. 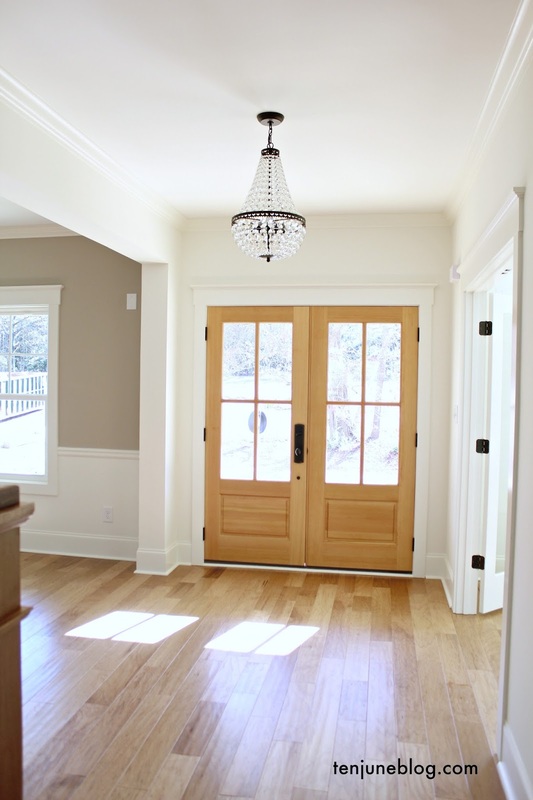 Check out some of their pendant lighting options here. Thanks to Arhaus for partnering up and helping me dream and scheme about my beautiful dream closet! Hi friends! Thanks so much for the love on our new kitchen! I'm excited to share our living room and keeping room with you today as those are the two rooms on either side of the kitchen. 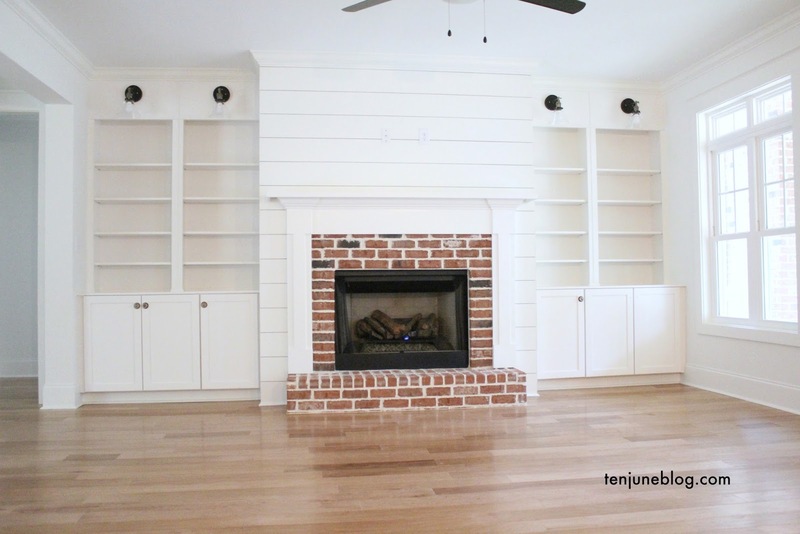 We planned an open concept main living space, so the living/family room, kitchen, breakfast nook area and keeping room (an old-fashioned term for a hearth room located next to your kitchen) are all basically in one big open area. We've only been in the house for about two months, but this space has become our absolute favorite place in the house to spend time together as a family. And it's been great for hosting large groups! 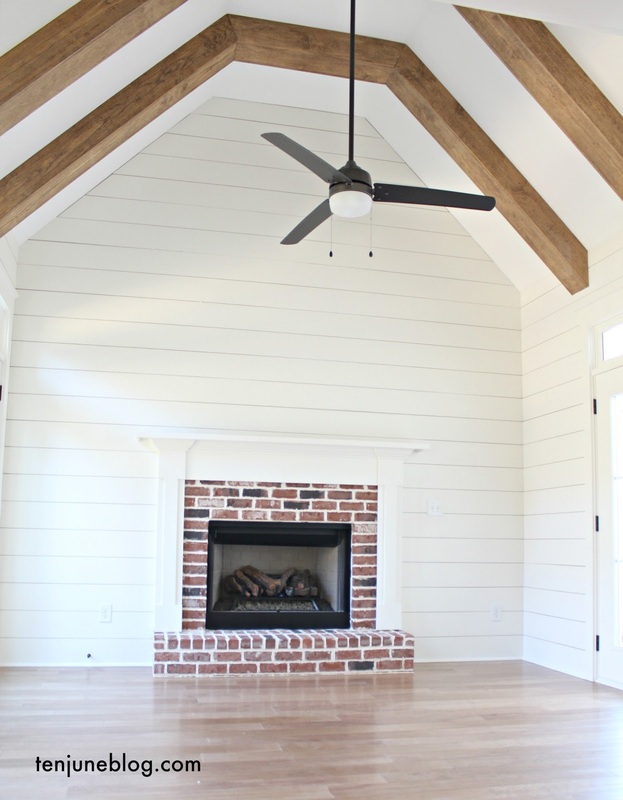 We vaulted the ceiling of the keeping room (FYI this room sits at an angle off of the back part of our house, almost like an add-on) and added wooden beams along the ceiling line. We actually just built out the beams with stain grade 1x6 pieces of wood which saved a lot of cost (and weight) instead of purchasing real solid wood beams! 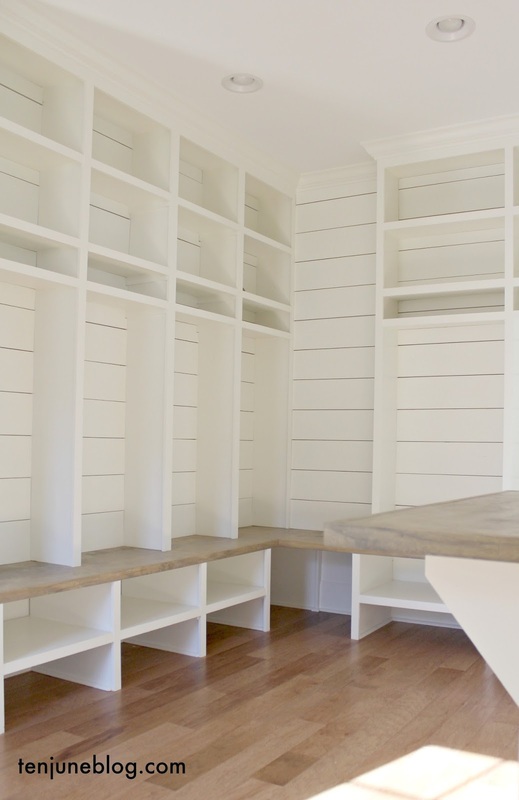 The walls, as you can see, are all shiplap. And we added French doors on all sides of the room- one set going out to our courtyard area and two sets of French doors going out to our back patio. 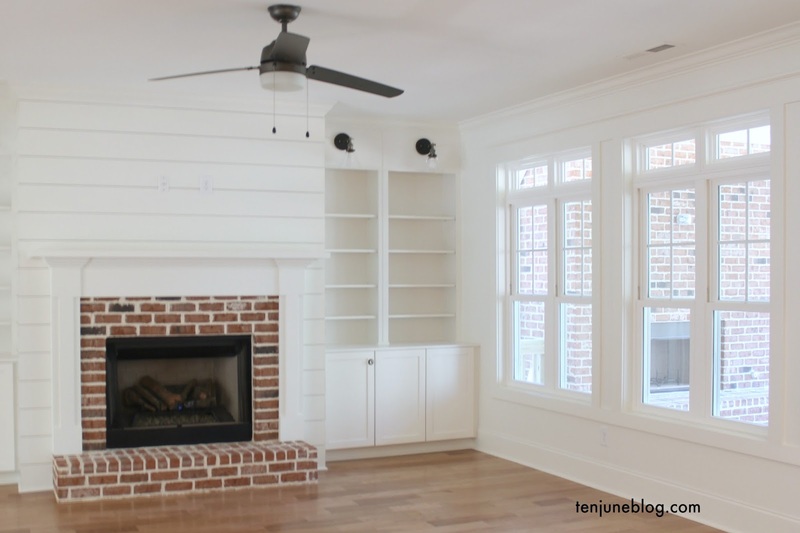 Our living room is pretty simple- with only two walls, we made one a wall of windows looking out over our outdoor living area and the other a wall of built in bookshelves surrounding the fireplace. We don't have a playroom downstairs, so all of the kids toys are now in those shelves. It's working out great for us so far and we love having them playing in our main space so we can keep an eye on them while we cook dinner or hang out on the couch. I think the star of the show in both rooms are the fireplaces. 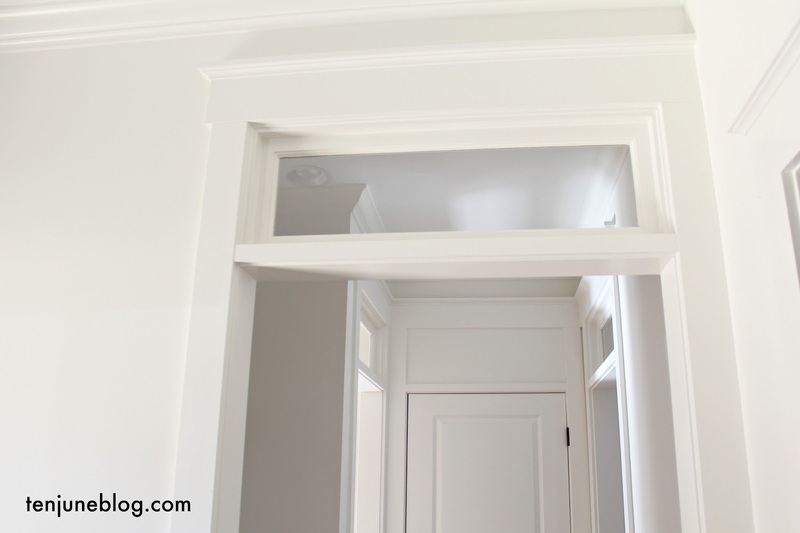 We designed them to match our simple farmhouse trim work but they've also got a little touch of traditional and a little touch of Craftsman. I. love. them. 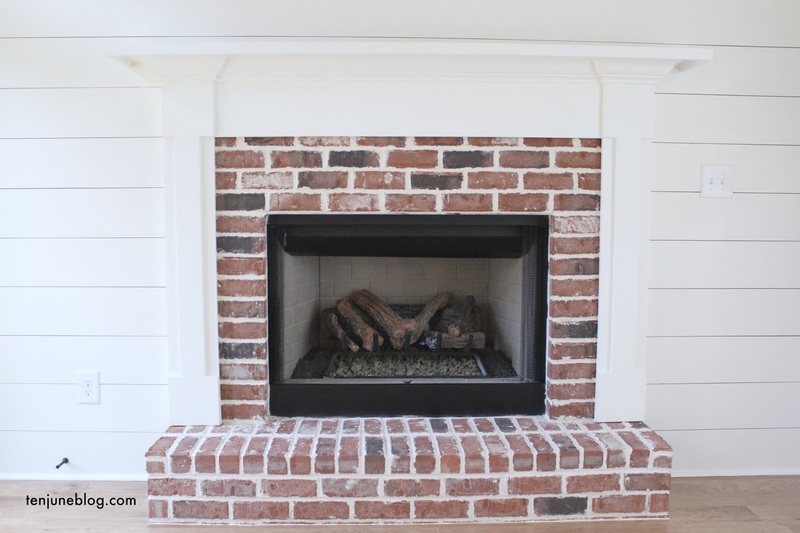 And for those of you wondering, they are B-vent gas fireplace logs (that I can turn on with the flick of a switch! score!). We actually have been using both fireplaces almost every day. I usually wake up and one of the first things I do is read my Bible with a cup of coffee by the fireplace in the keeping room. And of course we've had the fireplace on in the living room most nights we're in there! And, hello, it was so fun to decorate two mantels for Christmas. So here's our main space! Hope you like it! The kitchen. Ahhhh, the kitchen. This room is easily way up there in the race for my favorite rooms in the house. 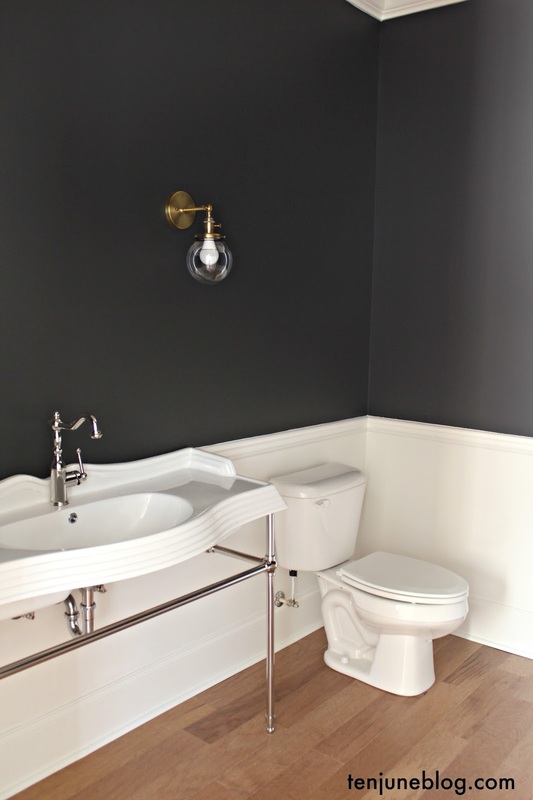 I love this room because it's open... lots of walkway space, lots of counter space, lots of seating... and classic- you can't go wrong with a black, white and brass scheme! I feel like I have so much to say about this room... I'm just going to start brain dumping about designing this room. If I miss anything, feel free to leave questions in the comments and I'll update the post! 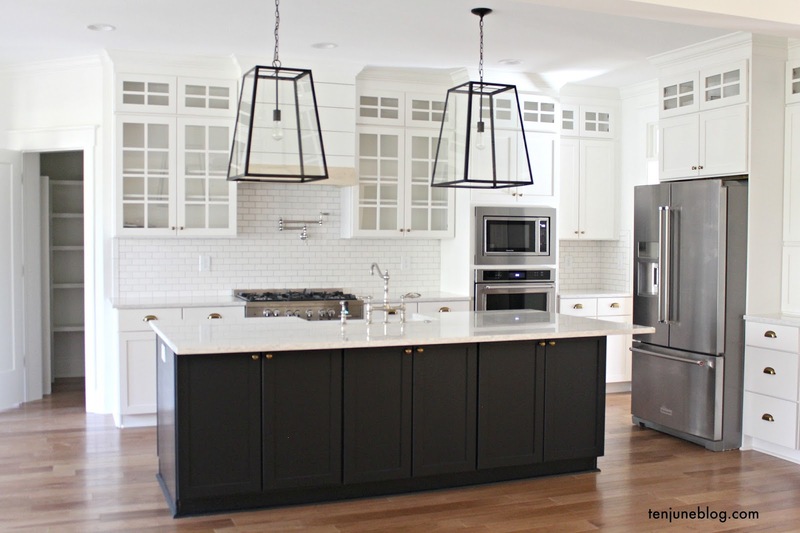 I always knew I wanted a black and white kitchen (see here! ), so it was a pretty easy choice to start with the cabinets. 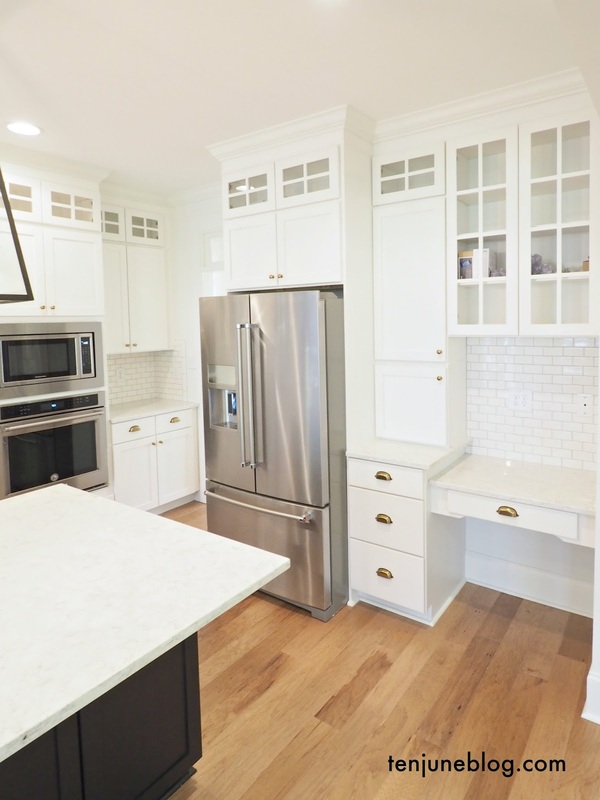 We chose a Shaker style white cabinet (which is eerily similar to SW Alabaster, an off-white) and mixed in glass and solid uppers. We wanted to max out our 9 foot ceilings in terms of design and function, so we added the 12" box cabinet on the top with 36" uppers under the box. 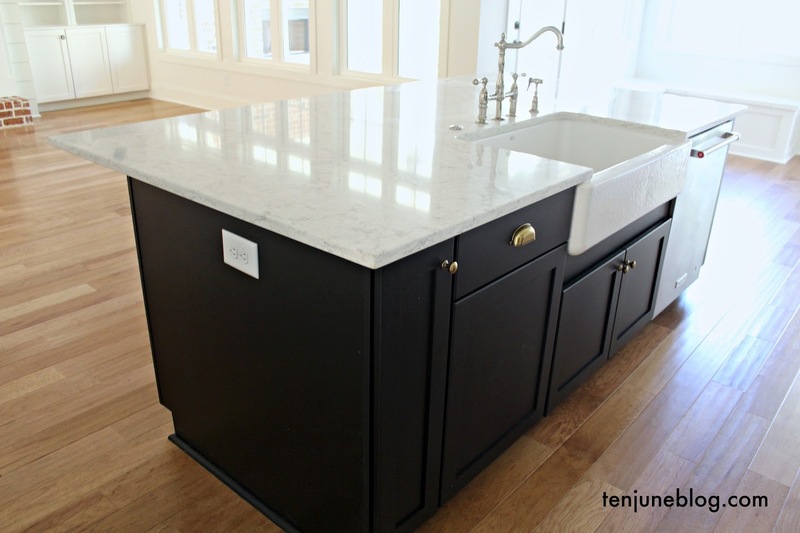 Our island cabinets are black (by the way, our island dimensions are: 4' x 8.5'). All cabinets are made by Legacy, happy to share more details about which selection we made if anyone wants (I know some of you out there are shopping cabinets! ), just shoot me an email. 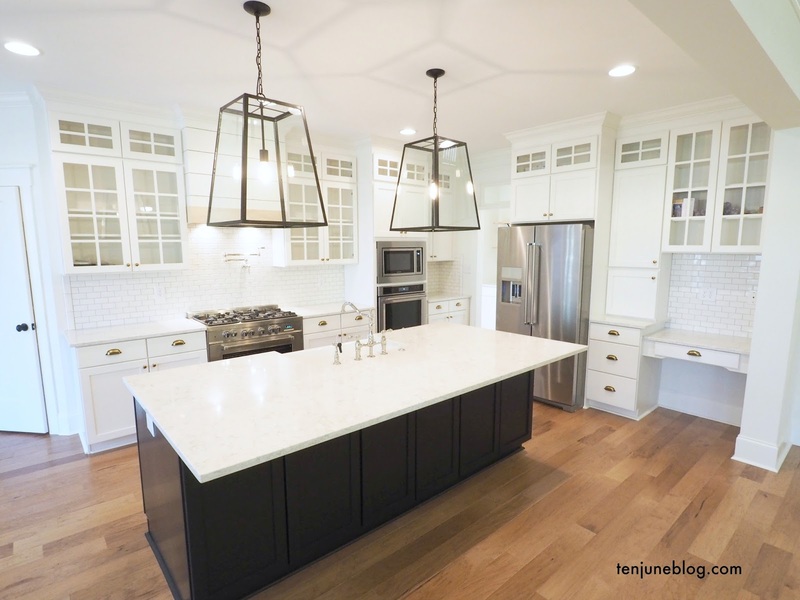 Read all about the counter top selection right here. I took a biiiiiig leap of design faith (way outside my comfort zone!) and mixed a bunch of metals in here. Probably more than is "allowed" (stainless steel! brass! oil rubbed bronze! 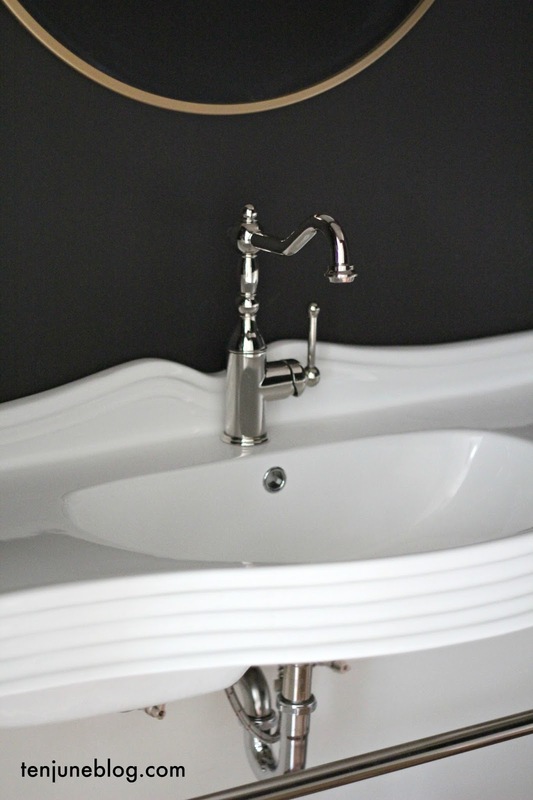 polished nickel!) but I absolutely love the way it works together. 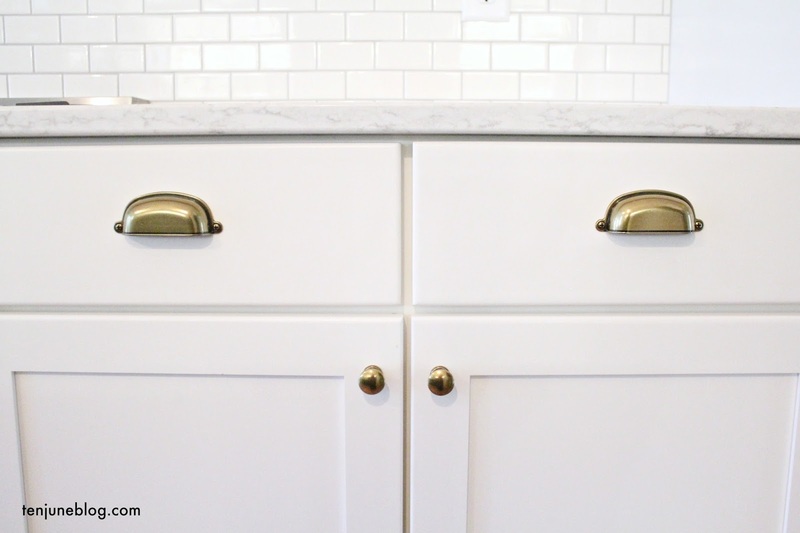 I knew I wanted brass in this room, but I was scared to commit to anything too permanent or expensive, so we went with brass hardware. 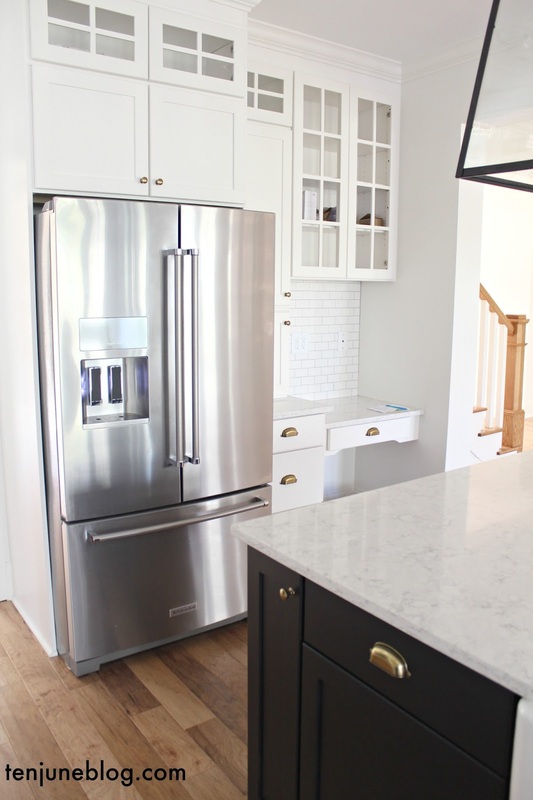 I took a tip from Studio McGee and chose polished nickel (instead of chrome) as it has warmer undertones and pairs more easily with brass or gold or bronzes. I actually extended this tip throughout my entire home... I love me some polished nickel! As for appliances, we splurged a bit and bought mostly KitchenAid Pro products. 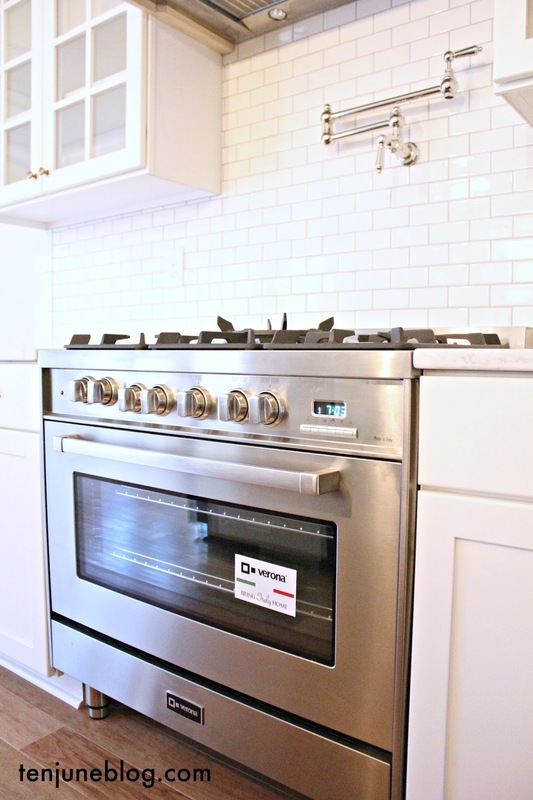 The KitchenAid Pro gas range oven wasn't in our budget, so we chose this Verona dual fuel range and LOVE it so far. We typically bake in the wall oven and cook over the range, but we have also used both ovens at the same time a few times over the past few weeks since we've been here. Game changer. Besides being open and classic (and having a giant island), I also always knew I wanted a desk space in our dream kitchen. I have just always pictured putting a desktop computer there and letting the kids do homework while I get supper ready, instead of letting them hole up in their rooms. 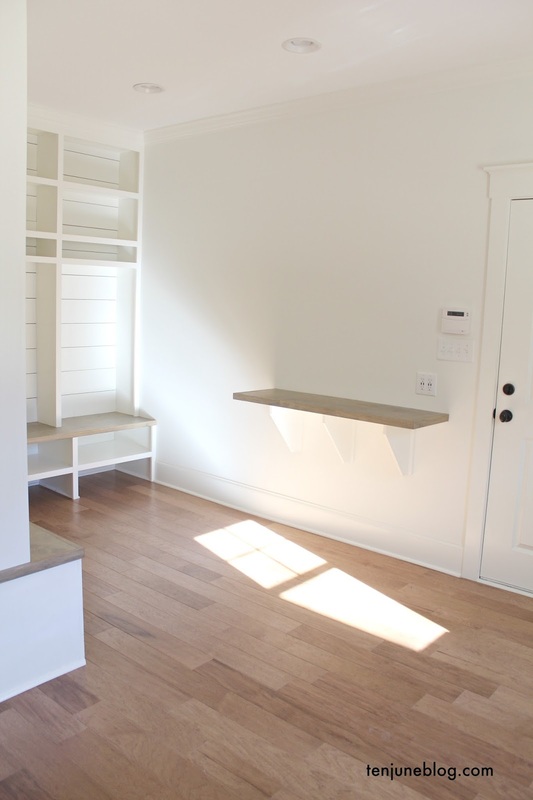 It's also a great "drop spot" for clutter and mail that somehow doesn't find a place in the mudroom. 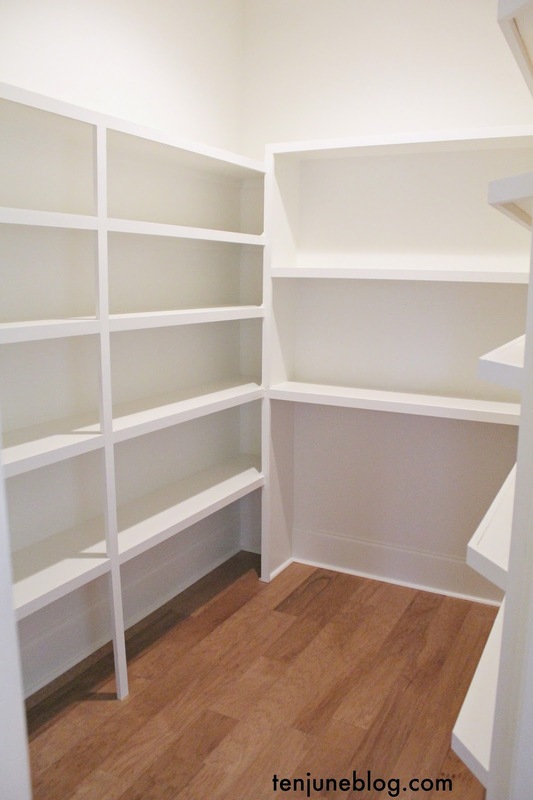 Did I mention the giant walk-in pantry? Talk about another game changer! I've got my counter top appliances lined up on some of the bigger shelves... I LOVE having all that space to organize the kitchen clutter and food! 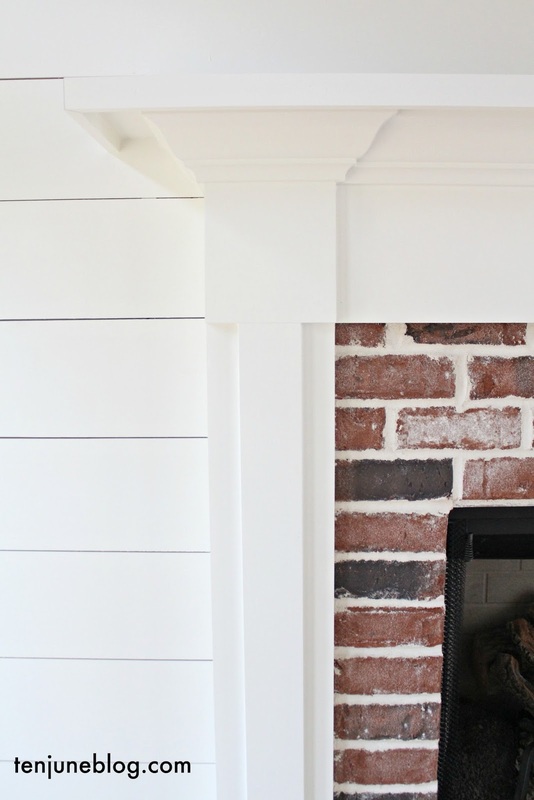 I just realized that I didn't get any up-close photos of our custom shiplap range hood. Bad blogger. I promise I'll devote an entire post soon to that beauty. 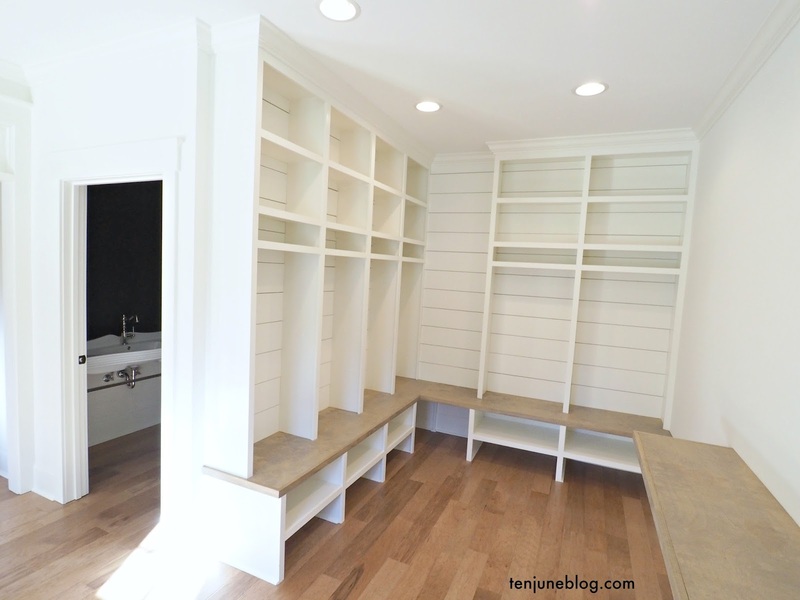 Also, I will say that since this photo, the shelves have been lined up with the mullions on the windows of the glass uppers... that drove me crazy then and drives me crazy just looking at these photos now! Hi friends! I've had so much fun sharing the house with y'all so far. 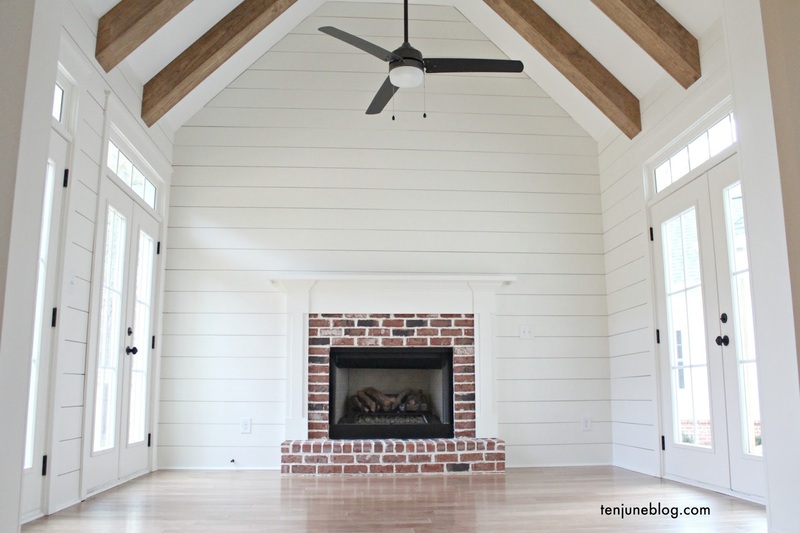 I've gotten a ton of questions about sources from the last couple of posts and Instagram... your main questions being sources for flooring, counter tops, tile and lights! 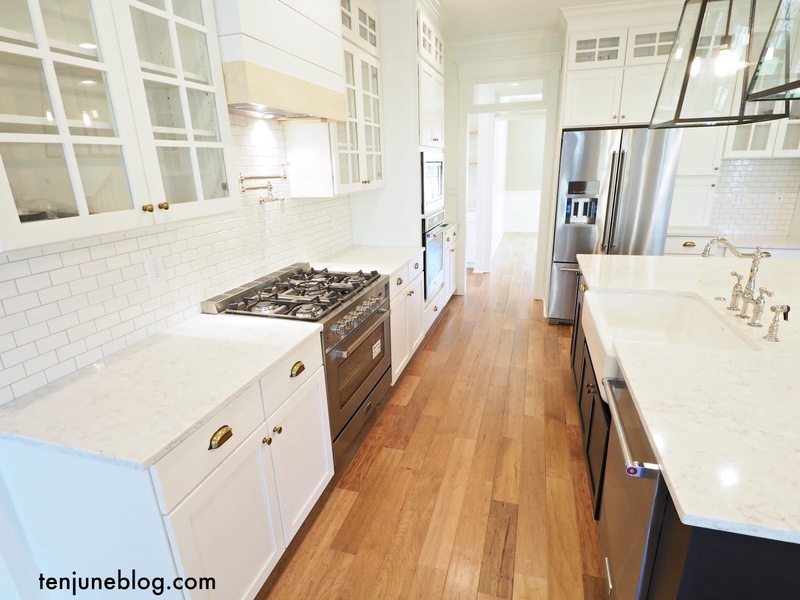 Today I'll tackle the first two- our flooring and countertop selections. First off, let me say that I jumped in and sourced most of the interior finishings for our house myself (instead of going through the companies our contractor recommended). It was quite the bear of a task, but in the end, I'm really happy we did it- we were able to buy what we wanted at a better price and saved some big money. I plan to write a separate post about the process of sourcing everything myself, though, so stay tuned! In our kitchen, we chose a quartz material. 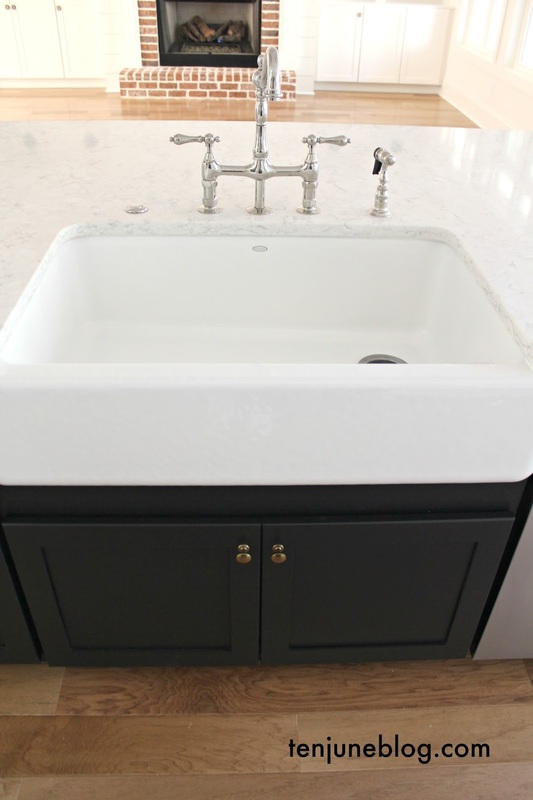 We love the look of marble but it's such a porous stone that I was really worried about staining, chipping, etc. So we chose a quartz that looks a lot like marble. From what I understand, quartz is one of the stronger natural stone counter materials, and I can vouch- ours has already withstood the (accidental) tests of blue food coloring and red wine just fine! The brand is LG Viatera Minuet. We absolutely love it! 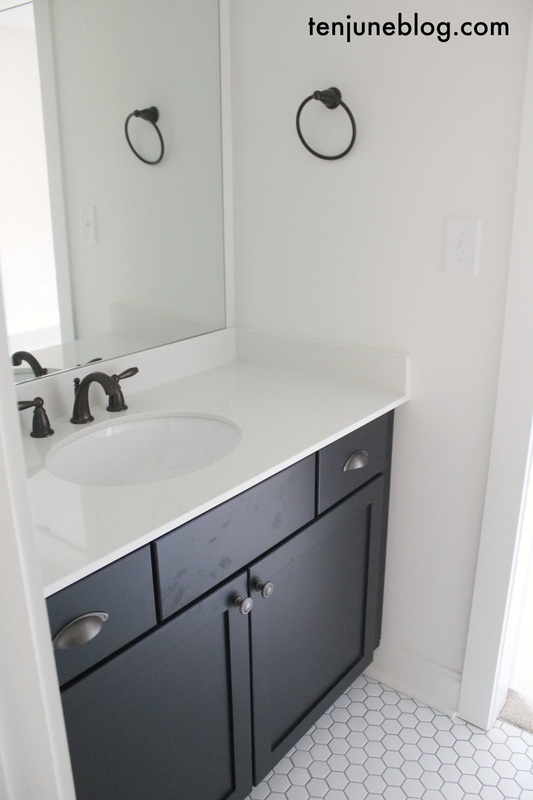 Our downstairs bathrooms (including the powder bathroom and our guest bathroom) have furniture type sinks, so those came with their own tops. 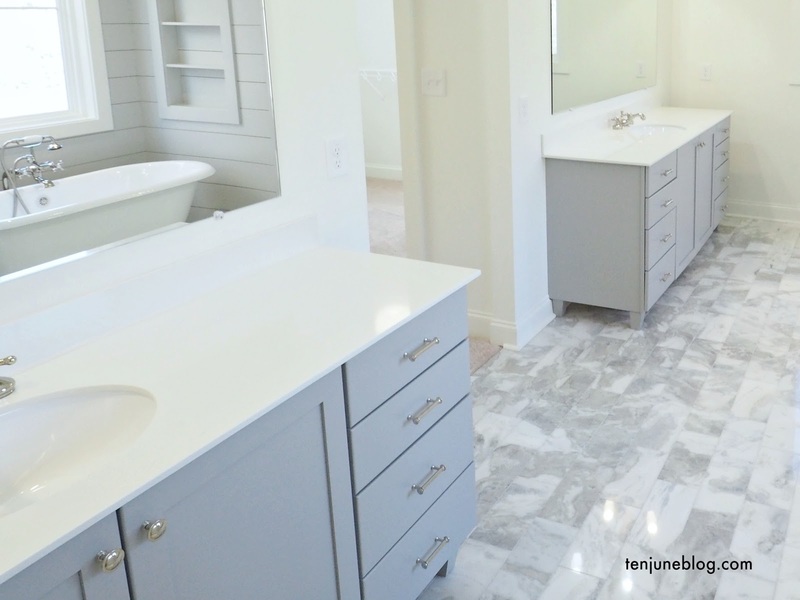 But upstairs in the kids baths and our master bathroom, we went with an engineered polar white marble. 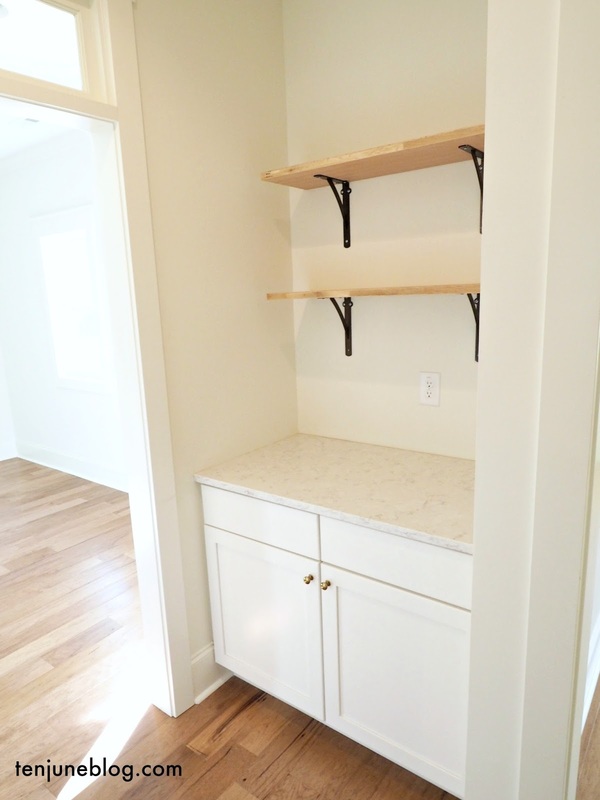 It was a really inexpensive material that basically gave us a pretty, faux marble blank slate. 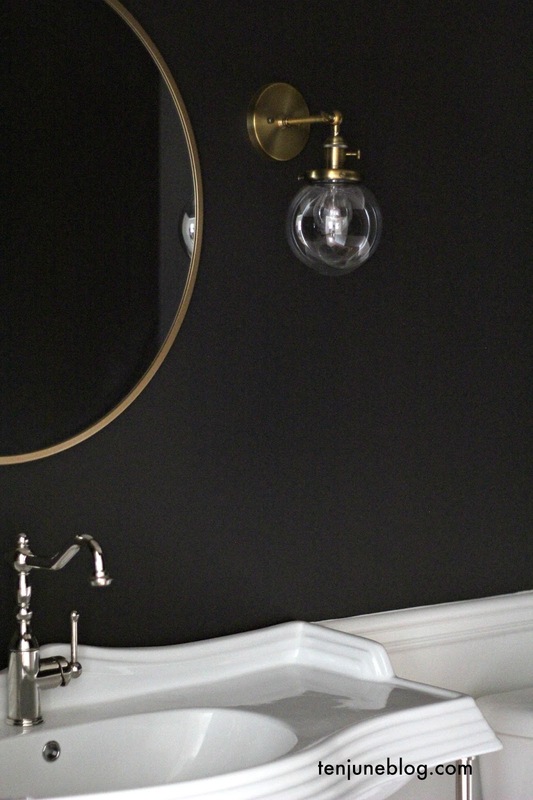 We chose painted vanities in all the baths and really wanted those colors to shine, instead of the counter tops. 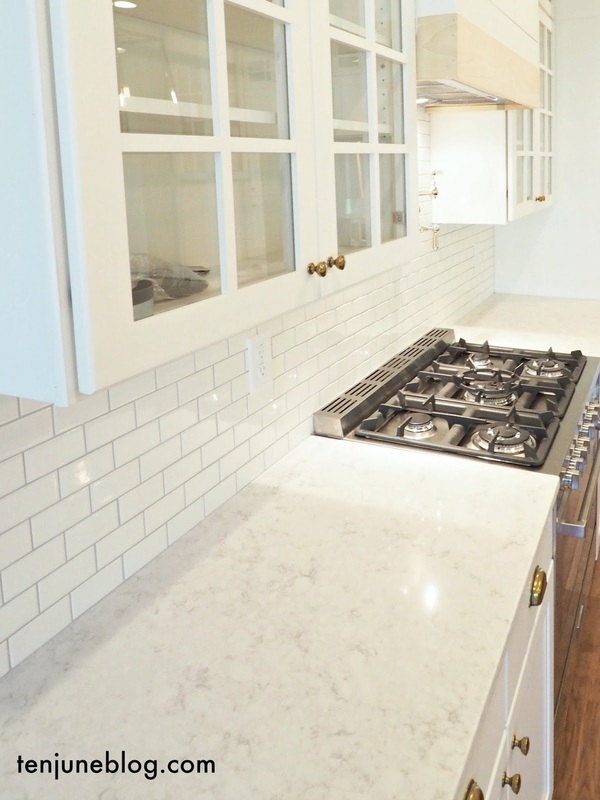 And while the engineered marble is really pretty, it definitely doesn't try to compete with the cabinets, which is just what we wanted! 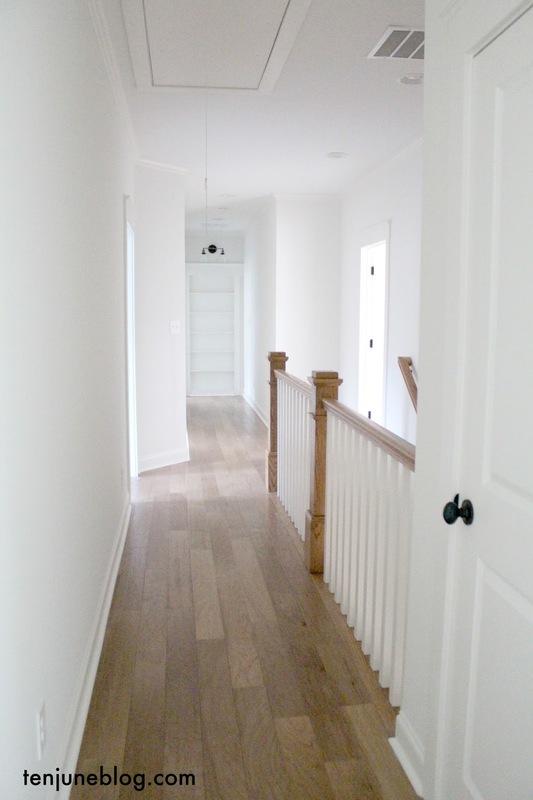 We chose to do hardwood floors in our entire downstairs (except for the guest bedroom) and in our upstairs hallway. I. am. in. love. with. our. floors. Seriously, guys. One of my favorite things in the house. I am a big fan of gorgeous dark hardwood floors, but I knew that I wanted a) something easier to keep clean (dark hardwoods would show Tucker hair like woah!) and b) something a bit more rustic/farmhouse style. 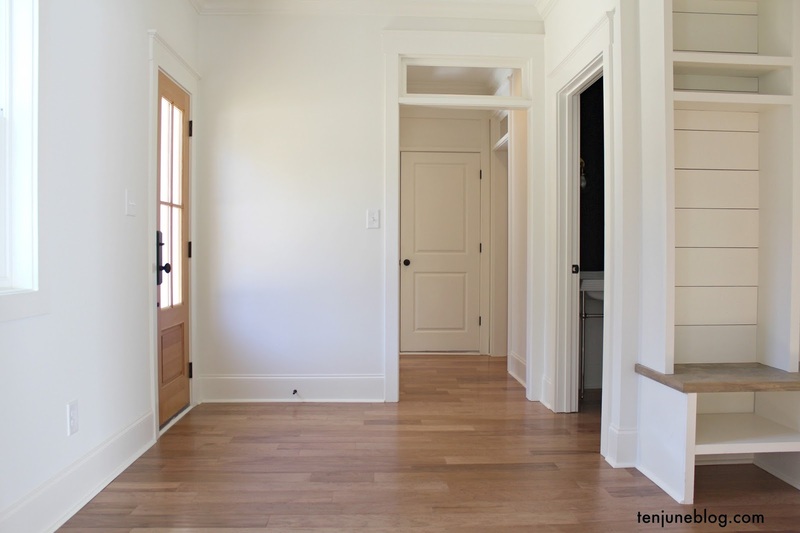 We wanted a wider plank and chose to go with engineered floors as they fit our budget the best. In the end, Mohawk's Woodside Hickory in Harvest Hickory (WEC89-65) was our choice. It's a hand-scraped hickory wood, so it's extremely hard and stands up to scratches and dents. But it's also already got a few nicks and dings in it which give it character... and also helps to hide any new scratches or dents! And I love the variation in the tone of the wood- lots of lighter spots with some golden areas and even some dark knotty spots. It just has so much character! We literally have loved this floor every single minute we've had it. For our stairs, we had red oak treads that the paint crew stained to match the hardwood floors (I have no clue the color!). It's amazing how great they look together, especially with that Craftsman-esque chunky bannister! 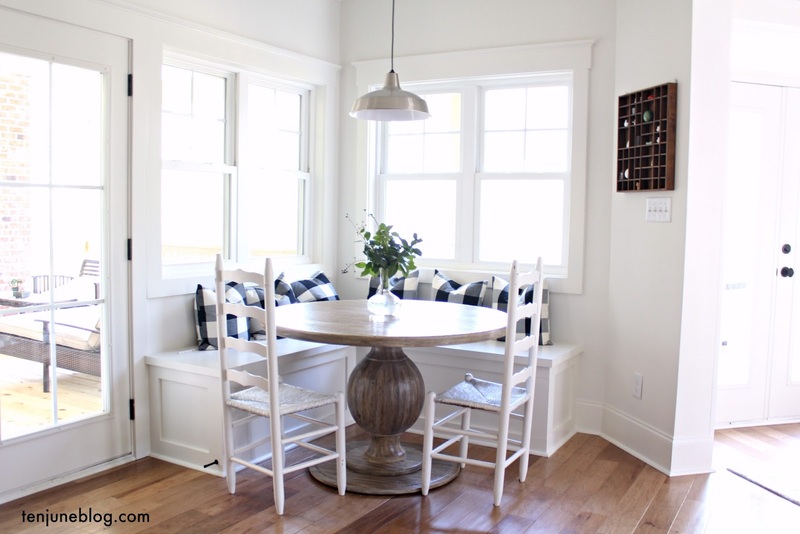 Later this week, I plan to share more about our kitchen, especially since I gave you some sneak peeks today! What items do you want me to source next? Lights? Tile? Let me know!